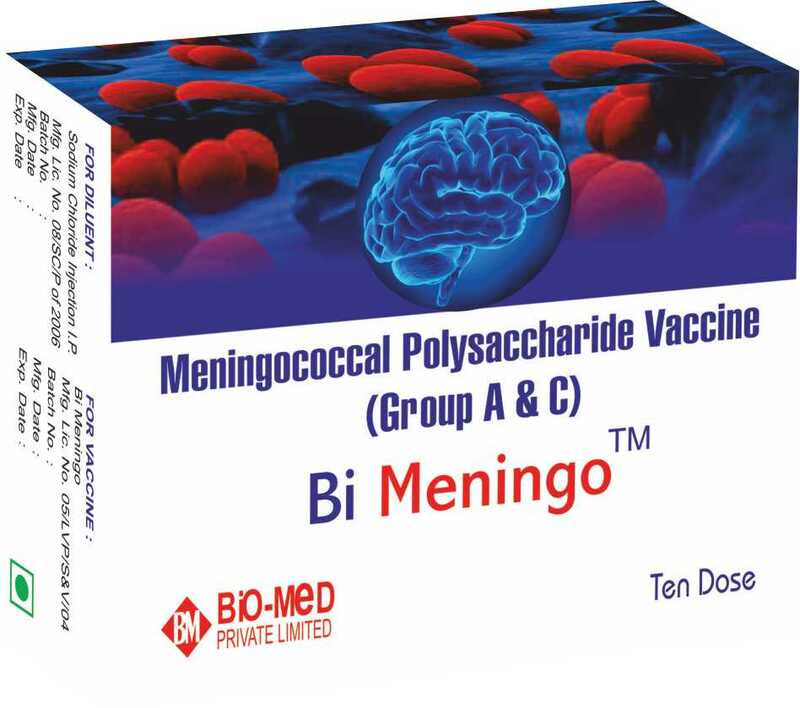 Meningococcal Polysaccharide vaccine is to be used to protect against cerebrospinal meningitis and other diseases caused by Neisseria meningitidis (Group A & C). Bi Meningo™ fulfills the requirements of Meningococcal Polysaccharide Vaccine as given in Indian Pharmacopoeia.The manufacturing facilities meets the requirements of cGMP guidelines of revised schedule ‘M’ of Drugs & Cosmetics Act of Government of India. Vaccination is recommended in regions of endemic infection, travelers to countries with epidemic meningococcal disease, household or institutional contacts, military recruits etc. It is also recommended for subjects living in closed communities and close contacts of patients/carriers of Meningococcal Group A & C.
Administer the vaccine(0.5 ml) by intramuscular or subcutaneous route. Hypersensitivity to any of the vaccine component. Administration of single 0.5ml dose of Bi Meningo™ (Group A & C) elicits a significant bactericidal antibody response in about 100% of subjects. Immunity is conferred for three years. The seroconversion rate of children vaccinated under the age of two years is lower for the serogroup C. However, the seroconversion rate for the sero-group A is acceptable in children from the age of 6 months onwards. Reaction to vaccination generally consists of localized injection site reaction (pain, redness), transient hyperthermia, headache, vomiting in children etc. Store between 2oC to 8oC in the refrigerator. Product is good to use for 24 months from the date of manufacture. 1. One dose in glass vial with diluent and disposable syringe. 2. Ten dose in glass vial with diluent.